1. Sunway Institute for Healthcare Development (SIHD), Sunway University, Jalan Universiti, Bandar Sunway, 47500 Subang Jaya, Selangor Darul Ehsan, Malaysia. 2. Molecular Pathology Unit, Cancer Research Centre (CaRC), Institute for Medical Research (IMR), Jalan Pahang, 50588 Kuala Lumpur, Malaysia. 3. Institute for Research, Development and Innovation, International Medical University (IMU), Jalan Jalil Perkasa 19, Bukit Jalil, 57000 Kuala Lumpur, Malaysia. 4. Anatomical Pathology Department, Sunway Medical Centre, Jalan Lagoon Selatan, Bandar Sunway, 47500 Subang Jaya, Selangor Darul Ehsan, Malaysia. Exosomes are 40- to 100-nm membrane-bound small vesicles that carry a great variety of cellular cargoes including proteins, DNA, messenger RNAs (mRNAs), and microRNAs (miRNAs). These nanovesicles are detected in various biological fluids such as serum, urine, saliva, and seminal fluids. Exosomes serve as key mediators in intercellular communication by facilitating the transfer and exchange of cellular components from cells to cells. They contain various pathogenic factors whereby their adverse effects have been implicated in multiple viral infections and cancers. Interestingly, accumulating evidences showed that exosomes derived from tumour viruses or oncoviruses, exacerbate virus-associated cancers by remodelling the tumour microenvironment. In this review, we summarize the contributing factors of Epstein-Barr virus (EBV) products-containing exosomes in viral pathogenesis and their potential implications in EBV-driven malignancies. Understanding the biological role of these exosomes in the disease would undoubtedly boost the development of a more comprehensive strategy to combat EBV-associated cancers and to better predict the therapeutic outcomes. Furthermore, we also highlight the potentials and challenges of EBV products-containing exosomes being employed as diagnostic markers and therapeutic targets for EBV-related cancers. Since these aspects are rather underexplored, we attempt to underline interesting areas that warrant further investigations in the future. The current progress of therapy or therapeutics development against cancers is still not able to address the elevating cancer-related morbidity and mortality worldwide. Multiple challenges continue to exist in the development of anticancer drugs, which include the lack of suitable study models , as well as conundrums over drug toxicity , delivery , and bioavailability . Accumulating evidences demonstrate that surrounding stromal cells such as tumour-infiltrating lymphocytes, fibroblasts, mesenchymal stem cells and macrophages/ monocytes in tumour regions may contribute to the failure of anticancer drug treatment [5,6]. Other pathogenic factors derived from tumour viruses (also known as oncoviruses) [7,8] and tumour-derived exosomes [9,10,11] may also help to establish a protumoural microenvironment by orchestrating multiple tumour-mediated signalling pathways hence complicating the anticancer treatment. Exosomes are small membrane bound vesicles that are secreted by cells. These extracellular vesicles (EVs) carry a wide range of molecules that have implications in cell-to-cell communications, hence contributing to pathogenesis of various diseases and infections [9,10,11,12,13]. There are several types of EVs which are apoptotic bodies (500-2000nm), microvesicles (50-1000nm), and exosomes (30-100nm) which are usually differentiated by cellular origins but not size [14,15]. Due to the lack of distinctive vesicle-specific marker within the membrane-bound small vesicles, the term exosomes are often used interchangeably with small EVs . Exosomes are defined as membrane-bound vesicles formed within multivesicular bodies (MVBs) or late endosomes which secreted from the cell . Exosomes are formed through an endocytic pathway (Figure 1), endocytosed materials are delivered to early endosomes and they are either sent for degradation after fusion with lysosomes, or enter the secretory pathway via MVBs. The vesicles within MVBs are known as intraluminal vesicles (ILVs) and they are called exosomes following their release from the MVB upon fusion with plasma membrane to the milieu (Figure 1) [14,15]. The roles of exosomes in viral pathogenesis have been recently reviewed, including those in human immunodeficiency virus type I (HIV-I) [12,13], EBV [17,18], hepatitis C virus (HCV) [19,20], and human T-cell lymphotropic virus type I (HTLV-1) [21,22]. More importantly, some of these exosomes have been shown to aggravate the tumour development and dissemination [14,23]. For examples, exosomes from EBV-infected nasopharyngeal carcinoma (NPC) cells contain hypoxia-inducible factor-1a (HIF1a) and latent membrane protein-1 (LMP-1) that contribute to the tumour development and progression in NPC [23,24]. NPC-derived exosomes also play multiple roles in immune evasion in order to support and sustain the tumour growth [24,25]. On the other hand, the human papilloma virus (HPV)-associated exosomes have been shown to contain microRNAs that were associated with cervical cancer . More than 90% of world's population is infected with EBV and its contributions to various lympho- and epithelial-malignancies such as NPC, gastric carcinoma (GC), Burkitt lymphoma (BL), Hodgkin lymphoma (HL), and Non-Hodgkin lymphoma (NHL) are well-documented [27,28]. Exosomes have been shown to play important roles in the EBV infection and spreading [17,18]. However, little is known about the functions of EBV product-containing exosomes in the cancer development and progression that have been partly discussed in several reviews that focus on virus-derived exosomes [14,22,29,30]. In this review, we summarize the functions of exosomes in EBV pathogenesis and their contributions to several EBV-driven malignancies based on current findings, particularly on NPC. We also discuss the potentials of developing the anti-cancer therapy that target the EBV-associated exosomes and exosome-based biomarkers for diagnosis of EBV-related cancers. Moreover, we attempt to highlight the entailed challenges and limitations in the aforementioned endeavours. Schematic diagram showing the EBV-related pathogenic factors that contributes to cancer pathogenesis via exosomal pathway. Internal vesicles or multivesicular bodies (MVBs) are formed by the inward budding of cellular compartments. The cargo is packaged into intraluminal vesicle (ILVs) within MVBs. The MVBs contain a wide range of pathogenic factors depending on the producer cell. The MVBs either fuse with lysosomes to degrade MVB contents or fuse with cell membrane to release exosomes. 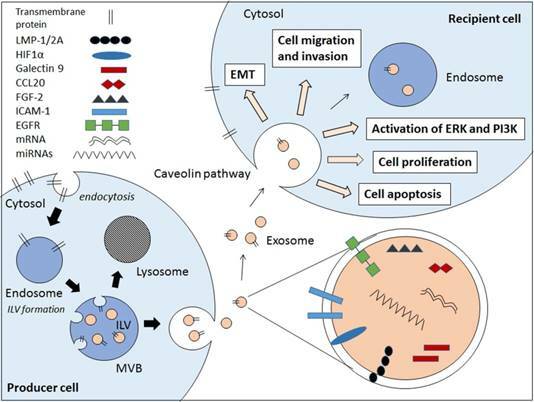 The exosomes enter the recipient cell via caveolae-mediated endocytosis and the pathogenic contents are implicated in the EBV-associated cancer pathogenesis. Exosomes are known to transfer proteins, DNAs, mRNAs, and miRNAs from cells to cells to modulate diverse cellular processes [14,22]. In recent years, works on pathogenic role of oncogenic virus-derived exosomes have been mostly focused on the cancer pathogenesis [29,31]. In the case of EBV-associated exosomes, their role in EBV infection and persistence is surprisingly less understood. It is crucial to understand the biology of exosomes in the virus pathogenesis given that virus-derived exosomes are likely to contain various virus-related proteins/genes that modulate the viral infection which may in turn, contribute to the cancer development and/or progression later on. Of note, the exosome contents largely vary depending on the state of viral infection. There is a general notion that the EBV infection aggravates the local infection site, hence increasing the frequency of the occurrence of EBV-related malignancies [27,32,33]. As EBV-associated exosomes are majorly detected in the virally infected cells, they may possibly aid EBV in manipulating the surrounding tumour microenvironment to favour tumour growth and survival. This can be supported by the work of Ahmed et al. who reported that EBV could hijack the exosomal pathway for the purposes of virus egress and immune evasion . Cumulative evidences also showed that EBV-associated exosomes specifically pack a variety of viral components (eg., LMP-1, LMP-2A, EBERs, viral RNAs, miRNAs, etc) which may promote the EBV infection [14,22,23,24,25,31]. The following subsection shall discuss the role of exosomes containing different EBV products in contributing to EBV infection and persistence. EBV latent infection, in general can be divided into three types (type I, II, and III). Latency type I is characterized by a high expression of Epstein-Barr virus nuclear antigen-1 (EBNA-1) which is usually seen in BL and GC. On the other hand, EBNA-1, LMP-1, and LMP-2 expressions are commonly seen in latency type II which occurs in the course of HL and NPC. In the case of latency type III, all latent proteins/antigens are expressed as commonly seen in acquired immune deficiency syndrome (AIDS)-related lymphomas and lymphoblastoid cell lines (LCLs) [27,32]. EBV LMP-1 and LMP-2 have profound effects on both virus and cancer pathogenesis. LMP-1 is the major viral oncogene expressed in most EBV-associated cancers, which mainly fall under the categories of latency type II and III as mentioned above. LMP-1 can be detected in exosomes from EBV-infected cancer cells and is transferable from producer to recipient cells using exosomes as vehicles [23,31]. This oncoprotein may not be directly involved in the establishment of EBV infection, but it contributes significantly to the success of virus spreading by ensuring the high production of infectious virions . Previously, immunohistochemical study on NPC tumour tissues have first demonstrated the positive correlation between protein levels of LMP-1 and exosomal marker CD63, suggesting that LMP-1 up-regulates the exosomal secretion during NPC progression . Indeed, recent findings by Hurwitz et al. showed that both exosomal proteins' level and extracellular vesicle secretion increased following LMP-1 expression. This resulted in greater LMP-1 accumulation and packaging in CD63-positive exosomes which can be impaired upon CD63 ablation . Given the above considerations, it is likely that LMP-1 could also enhance EBV spreading by stimulating the production of pathogenic exosomes which include the exosomal LMP-1 as well. Work by Nanbo et al. on the other hand, showed that LMP-1-containing exosomes increased the expression of intercellular adhesion molecule 1 (ICAM-1) that subsequently increased the proliferation rate of type III latency EBV-infected cells . In contrast, exosomal LMP-1 derived from LCLs have been shown to inhibit the proliferation of peripheral blood mononuclear cells (PBMCs) . Similarly, NPC-released exosomes containing LMP-1 and galectin 9 also exhibit the intrinsic T-cell inhibitory activity . These findings collectively suggest that exosomes containing LMP-1 can promote EBV pathogenesis mainly by down-regulating the antiviral immune responses whilst sustaining and supporting the growth of EBV-infected cells. Similar to LMP-1, presence of LMP-2A has also been detected in exosomes collected from EBV-infected LCLs . Interestingly, it has been shown that cholesterol depletion via methyl-beta-cyclodextrin (MCD) treatment can elevate the exosomal LMP-2A level and stability . However, the virus-specific effect of the exosome-derived LMP-2A in the EBV pathogenesis has not been evaluated before. Hence, little is known for the role of exosomal LMP-2A in virus pathogenesis as compared to the exosomal LMP-1. This question warrants future investigations as the pathogenic effects of cellular LMP-2A have been profoundly implicated in EBV infection [41, 42] and such effects could also be potentially manifested by the exosome-derived LMP-2A. In addition to LMPs, EBV-associated exosomes could also contain the Epstein-Barr virus-encoded small RNAs (EBERs). EBERs (i.e., EBER-1 and EBER-2) are non-coding RNAs that are abundantly expressed through the exosomal secretion in EBV-infected cells [34,43]. These EBERs are mainly responsible for the cellular transformation and anti-viral innate immunity . Ahmed and co-workers demonstrated that EBERs were excreted in the form of exosomes along with lupus antigen (La) ribonucleoprotein, which is an EBER-binding protein . However, the pathogenic effects of EBER-carrying exosomes upon their internalization into the neighbouring cells remain unexplored, which requires further investigation. EBV exosomes may also contain other viral mRNAs and miRNAs that are known to mediate EBV pathogenesis and persistence [18,45,46]. For instances, exosomes derived from EBV-transformed LCL can transfer the mature EBV-encoded miRNAs to the recipient dendritic cells (DC) to suppress the expression of EBV target genes in the cells . While the EBV-containing exosomes play significant roles in the viral pathogenesis, the mechanism mediating the internalization of these exosomes into the target cells is still unclear although it underlies the phenotypic modulation of target cells by the exosomes. Nanbo and co-worker demonstrated that the exosomes from EBV-uninfected, type I and type III latency EBV-infected cells internalized into the EBV-uninfected epithelial target cells via caveola-dependent endocytosis . Since EBV products-containing exosomes could bind to various proteins/ receptors on target cells such as CD21 on B cells , exosome internalization is anticipated to be mediated via receptor-associated pathways. More studies are still required to decipher the exosome internalization pathway that facilitates EBV pathogenesis and persistence, which may contribute to EBV-associated carcinogenesis. Tumour-derived exosomes have been known to aggravate the progression and invasion of various cancers including breast, ovarian, and brain cancers [14,22]. While the EBV-associated exosomes facilitate the EBV infection and spreading , there are evidences showing that these exosomes contribute to various EBV-associated cancers such as NPC, GC, and BL . For instances, EBV oncoproteins LMP-1 released from exosomes has been involved in the activation of several tumour-related signalling pathways (i.e., EGFR/PI3K and AKT/ERK), and consequently promote tumour development and progression . In this section, we discuss the pathogenic role of EBV product-containing exosomes in various EBV-associated lymphoid and epithelial malignancies. Recent reports that show the exosomes-driven tumorigenesis and progression in the EBV-related cancers are summarized in Table 1. LMP-1 is expressed in EBV-associated cancers that display latency type II and III which include NPC, HL, and AIDS-related lymphoma. Exosome-derived LMP-1 mainly attenuates the immune response during the establishment of EBV infection in the target cells. The immunosuppressive roles of exosomal LMP-1 are evident as shown in several studies on EBV-associated cancers. LMP-1-containing exosomes derived from EBV-infected lymphoblastoid and NPC cells were found to inhibit the T-cell activation and proliferation via a mechanism that could be mediated by the critical inhibitory motif in the conserved transmembrane domain of LMP-1 [24,48]. Flanagan and co-workers also proposed that exosomes containing LMP-1 may block the activity of infiltrating T-cells upon uptake of these exosomes and this blockade may contribute to the immune evasion of tumour cells . In another study, Ceccarelli and colleagues showed that the LMP- induced the expression and extracellular release via exosomes of fibroblasts growth factor 2 (FGF-2), a proangiogenic factor in tumour invasion. More remarkably, the authors also showed that LMP-1 could accumulate and concentrate together with FGF-2 in multivesicular bodies prior to their exosomal release via the Na(+)/K(+)-ATPase-dependent pathway . Meckes and co-workers on the other hand, showed that LMP-1-containing exosomes from LMP-1-overexpressed C666-1 NPC cells contained EGFR and PI3K as well. These exosomes were able to transfer LMP-1 and activate the ERK and AKT signalling pathways in multiple cell types, including fibroblast, uninfected epithelial, and HUVEC cells . This finding suggests that the transfer of oncogenic LMP-1 may modulate the behaviour of surrounding stromal cells, causing their aberrant activation that favours primary tumour growth via enhanced vascularization as in the case example of HUVEC cells. It can be envisaged that neighbouring epithelial cells could be possibly transformed into cancer cells as a consequence of the oncogenic LMP-1 transfer via the exosomal pathway. Apart from that, exosomal LMP-1 also up-regulated the expression of ICAM-1 or CD54  in which their elevated expressions have been found in various cancers including NPC , GC , and NHL . Interestingly, Verweij et al have shown that LMP-1 can escape lysosomal degradation by first accumulating into endosomes, followed by exosomal secretion mediated by its interaction with the exosomal marker CD63 . High correlation of LMP-1 and CD63 also suggested that the LMP-1 up-regulated the exosomal secretion which may promote the EBV-associated cancers. . These observations may help to shed light on its constitutive oncogenic activities in various EBV-associated cancers . Cumulative findings suggest that the exosomal LMP-1 may promote the growth and progression of EBV-associated cancers (Table 1). Numerous studies have shown that cellular LMP-1 play multiple roles in the EBV latent infection and tumorigenesis particularly via activation of c-Jun N terminal kinase (JNK) , NF-kappaB , p38, phosphatidylinositol 3 kinase (PI3K)/Akt , MAPK , and JAK/STAT  signalling. Our group also has reported that LMP-1 overexpression promoted the degradation of p53 tumour suppressor protein which intimates that p53 could be inactivated in NPC by LMP-1 despite being found to be rarely mutated in the disease [61,62]. It remains to be seen whether exosome-derived LMP-1 retains all the functions of the cell-derived LMP-1. Similarly, epidermal growth factor receptor (EGFR) which is a LMP-1-inducible tumour-promoting target protein , is also secreted by exosomes . Following the exosomal delivery, the exosomal EGFR may contribute to the cancer pathogenesis. Notwithstanding all the above findings, the exact mechanisms of the LMP-1's exosomal packaging, trafficking, internalization, and secretion are still not fully understood and these require future investigation. As for LMP-2A, it has been shown to integrate into the exosomes and is released into the recipient cells. Yet, the role of exosomal LMP-2A in carcinogenesis is underexplored despite the fact that cell-associated LMP-2A have been extensively studied for carcinogenesis [64,65,66,67,68]. The fact that the LMP-2A is expressed consistently in all EBV-associated NPCs as compared to the restrictive expression of LMP-1 may suggest the clinical significance of exosomal LMP2A . Further investigation is warranted to examine the function of exosomal LMP-2A in the cancer development and progression. Evidences supporting the role of EBV-associated exosomes in tumour progression. miRNAs are small non-coding RNAs with size of about 20 nucleotides that regulate various cellular processes [70,71]. The mature miRNAs interact with the target mRNAs and block their activities by repressing the translation. The effects of miRNAs have been implicated in EBV-associated cancers such as NPC [72,73,74], GC [68,75,76], and BL [77,78]. Pandya and colleagues have in fact shown that viral miRNA expression is consistently higher in cancerous tissues as compared to the adjacent non-cancerous counterparts in various solid malignancies . It was also shown that the expression of these viral miRNAs is linked to significantly worse clinical outcome among early stage cancer patients, which potentially indicates the potential devastating pathogenic roles of viral miRNAs in cancer . The tumour-promoting miRNAs are also detected in exosomes. Due to the exosome biogenesis, it is thought that the biological effects of exosome-derived miRNAs may be slightly different compared to the cell-derived miRNAs. However, cumulative findings suggest that exosomal miRNAs retains their tumorigenic effects in various cancers similar to the cell-derived miRNAs [80,81,82,83,84]. For instance, Melo and colleagues demonstrated that breast cancer cells secreted exosomes containing RNA induced silencing complex (RISC) proteins, Dicer, TAR RNA binding protein (TRBP), and Argonaute 2 (AGO2), and these exosomes are capable of processing the precursor miRNAs into the active miRNAs that induce tumour formation . Interestingly, Ye and co-workers also demonstrated that exosomal miRNAs promoted the tumour progression in NPC . However, the profile of miRNA-containing exosomes and the pathogenesis mechanism of the NPC-derived exosomes were not evaluated in this study. On the other hand, Choi and co-workers showed that miR-BART15-3p could be detected in the EBV-associated exosomes and its expression level was 2 to 16-fold higher in the exosomes compared to the cellular level , but its roles in tumorigenesis was again, not studied. Overall, current findings suggest that EBV miRNAs may have high tumorigenic activities but more studies need to be carried out to support this speculation. Similarly, EBV-associated exosomes have been shown to carry mRNAs encoding for EBV oncogenes such as LMP-1, LMP-2, EBNA-1, and EBNA-2 and small RNA EBERs [18,34] (Figure 1). In regards to cellular EBERs, our group has previously demonstrated that NPC cells stably expressing EBER-1 and -2 consistently displayed an increased growth rate . Despite the potential oncogenic properties of exosomal EBV-encoded mRNAs, whether or not these mRNAs are transferable to recipient cells and exert the tumorigenic effects in EBV-associated cancers remains to be shown. 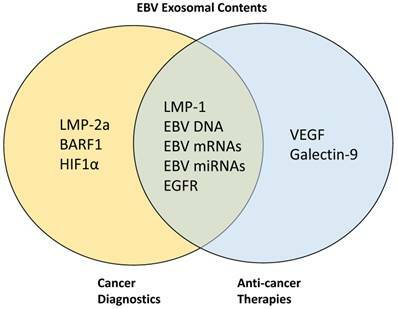 In addition to LMPs, EBERs, EBV-related miRNAs and mRNAs, exosomes containing other pathogenic proteins have also been reported to promote EBV-related cancers such as the transcription factor Galectin-9 [24,87], Deoxyuridine triphosphatase (dUTPase) , EGFR [31,89], HIF1α , and other interleukins  (Figure 1). Keryer-Bibens and colleagues demonstrated that the EBV-infected NPC-derived xenograft cells, C15 and C17 released the galectin-9-containing exosomes which have inhibitory action against PBMC-derived T cell proliferation . Similarly, high expression of exosomal galectin-9 was also detected in plasma from NPC patients and NPC-tumour xenografted mice and these exosomes induced apoptosis in the EBV-specific CD4+ T cells in the galectin-9-dependent manner . In the case of dUTPase, an increased amount of this protein has been detected in exosomes derived from the EBV-positive BL cell line, Raji which are found to induce the cytokine release from DCs and PBMCs which may activate the NF-kappaB pathway . Interestingly, EBV-associated exosomes also carry hypoxia-inducible factor-1α (HIF1α), a pro-tumorigenic molecule . Aga and coworkers have shown that LMP-1-inducible exosomal HIF1α contributed to the epithelial-mesenchymal transition (EMT) that may suggest its pro-metastatic role in promoting cancer progression. As one of the important therapeutic target for anti-cancer therapy, EGFRs are also over-expressed in NPC-derived exosomes . The same group have shown that the exosomal EGFR expression correlates with the LMP-1 level and could be induced by LMP-1. More importantly, the exosomes derived from the Raji cells and other EBV-infected cell lines are enriched with various immune modulators such as interferon-inducible protein 16 (IFI16), cleaved caspase-1, IL-1β, IL-18, and IL-33 . The presence of these proteins in the exosomes may suggest that the EBV utilize the host exosomal pathway in immune escape hence contributing to the progression and maintenance EBV-associated cancers. As described in earlier sections, cumulative findings have shown the marked tumorigenic role of exosomes in EBV-associated cancers. This suggests that these exosomes potentially represent useful biomarkers and strategies targeting these exosomes may be developed as a potent anti-cancer therapy. Similarly, EBV-associated exosomes that contain several other pathogenic proteins can also be targeted for cancer biomarker and therapy development (Figure 2). In this section, we summarize findings from the current works exploiting the EBV-associated exosomes as diagnostic markers as well as for the development of anti-cancer therapy. We also attempt to highlight the potential challenges and limitations that may be encountered in the above efforts. Target proteins in EBV-associated exosomes for cancer diagnostics and anti-cancer therapies. LMP-2A, BARF1, and HIF1α have been previously targeted for cancer diagnostics while VEGF and galectin-9 are targeted for anti-cancer therapy development. Other proteins such as LMP-1, EGFR, EBV DNA, mRNAs, and miRNAs are being targeted simultaneously for both diagnostics and therapeutic purposes. As abovementioned, exosomes containing EBV-related or other pathogenic factors may contribute to the cancer development and progression. These factors can potentially serve as useful markers for diagnosis or prognosis in cancers, particularly in the EBV-associated cancers. Recent advances in methods have facilitated the isolation of exosomes from the biofluids, making it a more feasible approach for the development of non-invasive liquid biopsy-based diagnostics [27,91]. The potential of developing exosomes into the biomarkers for cancers have been recently reviewed [92,93,94,95]. There have also been evidences suggesting that the EBV-associated oncoproteins can be targeted for cancer diagnosis. For instance, Houali and colleagues showed that both EBV oncoproteins LMP-1 and BARF1 could be detected in serum and saliva of NPC patients, and the secreted LMP-1 were strongly associated with the exosome-like vesicles . The fact that the exosomes are abundantly expressed in patient serum and saliva  further support the potential of targeting the oncoprotein-enriched exosomes in cancer diagnosis. Mao and coworkers also highlighted the potential of LMP-1 and LMP-2A as the candidate biomarkers for diagnosis and prognosis of patients with NK/T-cell lymphoma . In addition to EBV-related proteins, other pathogenic factors that are enriched in exosomes as abovementioned such as EBV DNA [98,99], EBV mRNAs [100,101], EBV miRNAs [102,103], Galectin-9 [87,104] have also been shown to be potential biomarkers for cancer diagnosis. On the other hands, the diagnostic value of EGFR and HIF1α has been previously demonstrated in other cancer types [105, 106]. More poignantly, exosomes have been shown to protect their cargoes from degradation. For instance, the encapsulated mRNAs and miRNAs are being protected from RNAses . The stability of the exosomal contents therefore, makes them the attractive biomarker candidates for cancer diagnosis. Further investigations are needed to evaluate the sensitivity and specificity of exosome-containing pathogenic proteins to be used as potential biomarkers for cancer diagnosis particularly in EBV-associated cancers. It has been reported that the tumour-derived exosomes could be the one of the major reasons for the treatment failure in cancers [108,109]. In this regard, cancer progression could be inhibited by blocking the activities of these exosomes. Figure 1 summarizes the pathogenic and tumorigenic factors derived from the EBV-associated exosomes and the potential targets for anti-cancer therapy development. Indeed, EBV-related proteins and nucleic acids (eg., DNA, mRNA and miRNA) have been previously shown as potential promising targets for anti-cancer therapy development [110,111,112,113]. For instance, various strategies such as cell-based immunotherapy, antibody-based and drug-based therapies have been developed against EBV LMPs . Cao and co-workers showed that DNAzyme resulted in significant tumour regression by targeting and cleaving off the LMP- mRNA from NPC patients . Other tumour-promoting non-EBV proteins that could be targeted include EGFR [114,115] and VEGF [116,117]. Similarly, targeting tumour-derived exosomes has been earmarked as a potent therapeutic strategy for cancer therapy although it must be noted that its potential remains to be explored [109,118]. In addition to carrying pathogenic factors that promote tumour formation and progression, tumour-derived exosomes could also play key roles in immune evasion of cancer cells as mentioned above [24,25,34,38]. Hence, blocking these exosomes may restore the activity of functional immune cells to kill the cancer cells. The immunosuppressive activity of NPC cell-derived and patient plasma-derived exosomes has been demonstrated on the PBMC-derived CD4+ T lymphocytes. The galectin-9-containing exosomes have inhibited the EBV-specific T-cell proliferation and induced apoptosis, hence preventing the cancer cells from T-cell-mediated recognition and killing of cancer cells [24,87]. Development of a therapeutic strategy to block the galectin-9 or other proteins from the exosomes may therefore restore the normal immune surveillance. Over the past few years, considerable work has also been done on targeting the whole exosomes rather than targeting the specific proteins [119,120]. The exosomal removal using a modified kidney dialysis system has also been proposed to be introduced in the clinical settings . These findings suggest that diminishing or eliminating the tumorigenic exosomes may be a good therapeutic approach to reverse the exosome-mediated cancer progression, particularly in the aspect of immune dysregulation. In addition to serving as therapeutic targets, exosomes have been interestingly adopted as vehicles for therapeutics delivery [121,122,123]. Ohno and coworkers demonstrated that the Let-7a miRNA-loaded exosomes targeting EGFR could be efficiently delivered to target the breast cancer-derived murine xenograft tissues . Similarly, Qi and coworkers showed that exosome-based delivery of drug in murine hepatoma xenografts could cause significant regression of tumour size . Hence, loading the existing exosomes with anti-EBV or anti-cancer therapeutic drugs or compounds might be a potent strategy to inhibit the tumour formation in addition to other advantages such as increasing the drug stability/ bioavailability and improving the drug delivery and cell permeation. Further investigations are warranted to examine the potency of these anti-EBV and/or anti-cancer exosomes in therapeutic intervention. While several lines of evidences showed that the EBV-containing exosomes can be targeted for the development of biomarker and/or anti-cancer therapy (Figure 2), several considerations need to be taken into account to ensure the success of the therapy and biomarker development. Sensitivity and specificity are important criteria for the cancer biomarker development. While the exosome-containing EBV oncogenic contents (eg. EBNAs, LMPs, and EBERs) have tumour-promoting and pathogenic properties and are expressed during the disease, they are not cancer type-specific and could be detected in various EBV-associated cancers such as NPC, GC, and BL . Hence, other non-invasive tests such as cancer antigen screening and magnetic resonance imaging (MRI) are required in combination with potential exosomal analysis to enhance the specificity of diagnosis towards a particular cancer type. Furthermore, the expression of latent proteins LMPs such as LMP1 may be low or even at undetectable level especially during the early stage of tumour formation , hence the resultant sensitivity may be a potential issue. Comparatively, EBERs are more suitable targets for detection as they are consistently expressed at detectable amount in all EBV latently infected cells or tissues . As an important therapeutic target, EBV proteins/nucleic acids can be targeted for tumour regression. There are a few challenges that may be encountered during the development of anti-cancer therapies. The exosomes play important roles in cell-cell communication mainly by regulating cellular processes, hence complete removal of exosomes is not a feasible therapeutic strategy as it will affect the well-being of cellular processes under a normal condition . Hence, it is important to specifically target only the exosomes enriched with the pathogenic factors without affecting the biological activities of other existing exosomes. In addition, the exosomal contents may largely vary and heterogeneous depending on the sources or origins . This may be another challenge especially the targeted exosomes are from the patient's circulating blood. Furthermore, some potential targets may be scarcely expressed or not at all in the targeted exosomes which will lead to the treatment failure. Other considerations in exploiting exosomes for drug delivery include the dosage of exosome-targeting drugs that may vary from one to another, the delivery system for targeting exosomes, the stability of the delivered therapeutic molecules, and the treatment course. Further works are needed to evaluate the clinical safety of exosome-targeting treatment strategy. EBV-associated exosomes undoubtedly play pivotal roles in the pathogenesis of the viral infections and EBV-associated cancers especially in NPC. The cumulative findings suggest that the EBV-associated exosomes are ideal targets for the development of diagnostic biomarker and anticancer therapy. However, several issues need to be taken into account during the development as abovementioned. Since limited studies have been carried out in general, future investigations are warranted to evaluate the association of EBV-exosomes in other related cancers such as GC, BL, and NHL. The targeted exosomes could also be potentially developed into vaccines for EBV infections, hence diminishing the chances of developing the EBV-associated cancers. To our best understanding, this is the first review that discusses the role of pathogenic exosomes in contributing to EBV infection and the associated cancers in a much focused approach. AGO2: Argonaute 2; AIDS: acquired immune deficiency syndrome; BL: Burkitt lymphoma; DCs: dendritic cells; dUTPase: deoxyuridine triphosphatase; EBERs: Epstein-Barr virus-encoded small RNAs; EBNAs: Epstein-Barr virus nuclear antigens; EBV: Epstein-Barr virus; ERK: extracellular signal-regulated kinases; EGFR: epidermal growth factor receptor; EMT: epithelial-mesenchymal transition; EVs: extracellular vesicles; FGF: fibroblasts growth factor; GC: gastric carcinoma; HCV: hepatitis C virus; HIF1a: hypoxia-inducible factor 1a; HIV-I: human immunodeficiency virus type I; HL: Hodgkin lymphoma; HPV: human papilloma virus; HTLV-I: human T-cell lymphotropic virus type I; ICAM-1: intercellular adhesion molecule 1; ILVs: intraluminal vesicles; JAK: janus kinase; JNK: c-Jun N terminal kinase; La: lupus antigen; LCL: lymphoblastoid cell line; LMP-1: latency membrane protein 1; LMP-2A: latency membrane protein 2A; MAPK: mitogen-activated protein kinase; MCD: methyl-beta-cyclodextrin; MRI: magnetic resonance imaging; mRNAs: messenger RNAs; miRNAs: micro RNAs; MVBs: Multivesicular bodies; NFĸB: nuclear factor kappa beta; NHL: Non Hodgkin lymphoma; NPC: nasopharyngeal carcinoma; PBMCs: peripheral blood mononuclear cells; PI3K: phosphoinositide 3-kinase; RISC: RNA-induced silencing complex; STAT: signal transducers and activators of transcription; TRBP: TAR RNA binding protein; VEGF: vascular endothelial growth factor. The authors would like to thank the Director General of Health Malaysia for permission to publish this study and the Director of the Institute for Medical Research for her support. We would like to thank Sunway Internal Research Grant 2016 (INTM-2017-SIDS-SIHD-01) and Rewarding Research Output (RRO) (INT-RRO-2017-095) from Sunway University and National Cancer Council Malaysia (MAKNA) Cancer Research Award (CRA) 2016 (EXT-SIDS-SIHD-MAKNA-2017-01) for partly supporting this work.